During the 2010 Turtle Road Mortality Monitoring Program, 101 mortalities were recorded where Rte. 119 crosses Beaver Brook in Littleton. 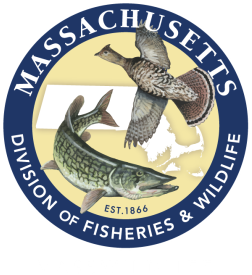 Due to this site being documented as one of the worst turtle mortality hotspots in the state, Linking Landscapes for Massachusetts Wildlife (LLMW) initiated a fencing project to prevent annual turtle mortality. A chain-link fence was installed on the north side of the causeway in May 2012. Due to the imminent start of the turtle nesting season, there was not enough time to install permanent fencing on the opposite side of the causeway, so a temporary silt fence was installed. Both fences were embedded within a 4-6” trench to prevent turtle roadway access from under the fence. In 2012, this site was monitored to test the impact of the fencing on turtle mortality. 2012 surveys documented 10 mortalities (9 painted turtles and 1 spotted turtle), a 90% reduction from 2010. Of the 10 mortalities in 2012, two appeared to be due to gaps at the chain-link fence end post/bridge abutment interface. The remaining eight mortalities appeared to result from turtles moving along the temporary barrier and past the end of the silt fence. Apparently, no mortalities resulted from turtles moving past the chain-link fence end posts. Our observations support the findings of Sievert and Yorks (personal communications) that barrier opacity is a significant predictor of rate of travel for painted and spotted turtles. Specifically, these species moved at faster rates when confronted with opaque barriers, compared to movements along translucent barriers. Consequently, turtles that move at faster rates along a barrier are more likely to reach the end and enter a roadway before giving up and returning to the wetland. The findings of Sievert and Yorks and our own case study suggest that an opaque barrier could be used to swiftly direct turtles into a tunnel. Conversely, a translucent barrier could reduce the potential for turtles to move beyond a certain point, such as where a barrier ends and access to a roadway is possible. The integration of an appropriate barrier design into a turtle passage structure is essential to ensure turtles are guided into the passage structure and avoid crossing roads. 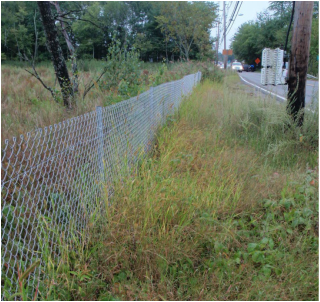 Learning from this case study, LLMW has successfully implemented similar barrier fencing projects at top road mortality sites across the commonwealth. These projects have yielded consistent results. Installation of the Barrier Fencing. Embedding the Fence Below Grade.